In this beginning course students will be introduced to different Ikebana designs starting with a fundamental designs to abstract design. How to find right materials for each design. How to grow your own flowers for Ikebana, what types of flower vases are good for each design, etc. 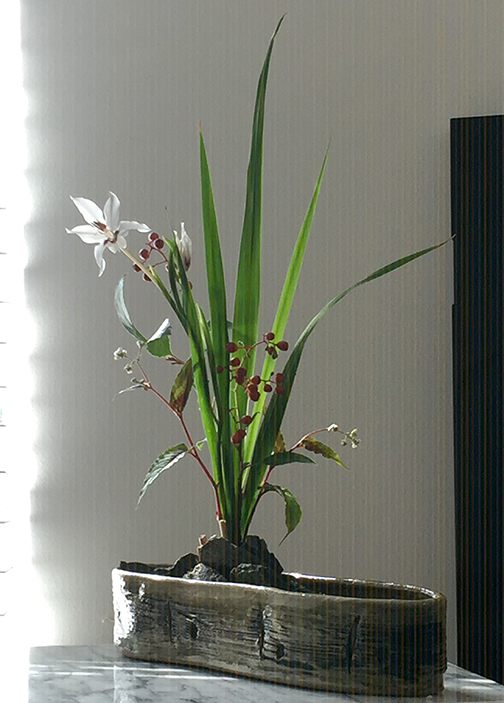 If you like flowers, gardening and nature, for sure you will enjoy Ikebana. This Ikebana is true to the spirit of classic Ikebana with modern twist, so you can learn aesthetic Japanese arts and culture (pottery, painting, architect, Japanese garden design, wood curving, etc.) through Ikebana. $65, $52 OHCA members, Plant materials provided but must bring your own vase. Makiko studied at the first Ikebana flower school, then offered a solo Ikebana Exhibit at the Bowers Museum, collaboration with the Tibet Exhibit in 2004. It was instant success. Since then she has been offering classes at local arboretums, art center, garden clubs and libraries as well as entering flower shows, initiating new flower show and serving as a flower show judge. Makiko invited Ikebana teachers from Japan to the States and frequently visits Japan for her continuous study of Ikebana and Japanese traditional arts. She formed a non-profit organization Makiko Floral Design Garden Club for educational purpose in 2009 to pursue her Ikebana study.